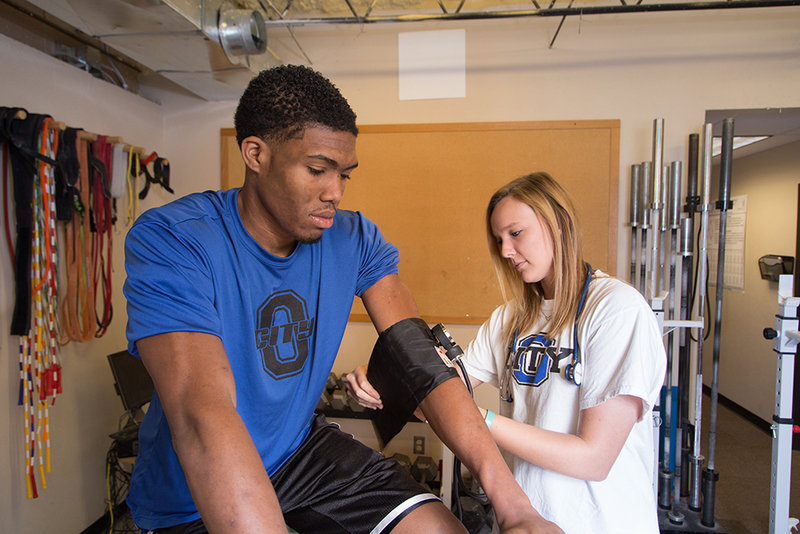 The Department of Exercise and Sport Science offers two majors to meet the career goals of any prospective student. A description of the major along with the courses needed for completion are listed below. Please contact Dr. Jason Miller with any questions: jmiller2@okcu.edu. This 65-hour rigorous major is offered to prepare and educate students who wish to enter the field of exercise science. Students are exposed to a strong science background (26 ancillary hours in chemistry, physics, biology) making them excellent candidates for employment opportunities in exercise-related areas (cardiac rehabilitation), advanced graduate studies (motor behavior, exercise physiology, nutrition), and professional schools (chiropractic, occupational therapy, physical therapy). Faculty advisors will help students choose appropriate electives to meet professional school prerequisites. Students interested in cardiac rehabilitation are encouraged to seek the Registered Clinical Exercise Physiologist certification or the Health Fitness Instructor certification offered by the American College of Sports Medicine during the internship and capstone courses. Use this document to plan your study in ESS.